You’ll find yourself here because, having wended a way through our streets, you’ll be a little thirsty, a little hungry, you’ll have seen the inviting tables outside Café Diamant, and you may have noticed the striking sculpture, and you’ll possibly be a little curious about this intriguing square – Plaça Diamant – the square that shares the same name as a book. Not just any book. But the novel by Mercè Rodoreda, which had, and still retains, a profound impact on Barcelonin and Catalan sensibilities. Should you want to read the novel its title in English is, The Time of the Doves. However, a considered and thoughtful review by Catalan/English writer, Matthew Tree persuaded me to buy a copy of the newest translation (by Peter Bush), titled, In Diamond Square. I’m very glad I did. 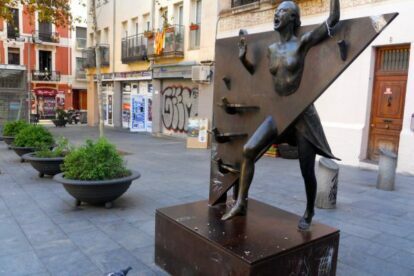 The striking sculpture, by Xavier Medina Campeny, is a representation of La Colometa (the Pigeon Girl), or Natalia, the main protagonist of Rodoreda’s novel. During the Civil War Barcelona was bombed 113 times by Italian fascists and 80 times by the Nazis. More than 2,500 people were killed. It is possible to visit the shelter (€ 3), but you’ll need to phone or email to reserve. Here’s a You Tube video. There’s a 1982 movie of the novel, often screened during the festes de Gràcia.